This Essay published only two years after a young Rem Koolhaas (with partners, Elia Zengelis and Madelon Vriesendorp) establish Office for Metropolitan Architecture (OMA) in Rotterdam, is the precursor to a larger work by Rem published the following year, Delirious New York. 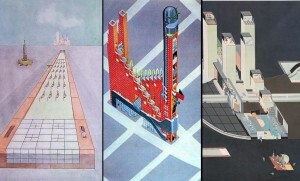 Along with this essay and Delirious New York, OMA at this time is exploring the foundations of the Metropolis through a series of sudo-surreal projects including: Welfare Palace Hotel, Spinx Hotel, and the Floating Swimming Pool. Life in the Metropolis is an attempt to understand contemporary urbanism and the metropolitan condition epitomized by Manhattan. 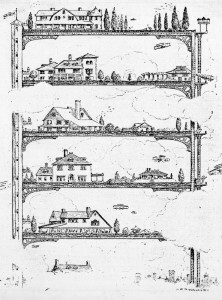 For Rem, the metropolis of Manhattan is a new “unscripted” mutation of conventional urbanisms which has remained outside the scope of architectural understanding and exploitation. By probing the socio-political, economical, and cultural foundations of Manhattan, and by recognizing its fundamental rupture from the gernerative principles of other urbanisms, Rem hopes to release the squandered potential of the modern metropolis. Unpacking to the metropolis to identify its generative principles, Rem describes three episodes that “circumscribe such an Urbanism that is specifically Metropolitan”. These episodes include: Coney Island, the Skyscraper, and Radio City Music Hall. Coney Island is described as a testing incubator of new experimental technologies later used in Manhattan and symbolizes a cultural/economical shift from the real to the synthetic. The rapid growth of the island as a popular weekend attraction for NYC residents, as well as limited space/resources inspire new technological apparatus to handle the sheer density of costumers. These phantasmic apparatus fuel a newfound appetite for the “superior” artificial and natural elements of the island are systematically replaced with manufactured experiences. A robotic cow that produces milk, electric lights that creates a second daytime, mechanized horses, and amusement rides mimicking intimacy, exemplify the substitution of the natural for the manufactured synthetic. These apparatus disconnect the user from the natural while reducing it to a “compulsory service”. These apparatus seem to be judged by how at once they can remove the natural while also how closely they can resemble the natural. Later this removal of the natural is repeated in the development of manhattan. Through disconnected platforms, the skyscraper can absorb the changing needs of the metropolis. Exteriors are sculptural objects which are inherently disconnected from the interior programs contained. In a way, the building acts as an implicit metaphor, a framework of abstract and changing programs replicated ad infinitum. This 6200 seat theatre opened in the early 1930s. The theatre is conceived as a metaphorical theme of a sunset. Air Conditioning, lighting effects, and synthetic materials support this metaphor and transport the visitors of the theatre into a conceptual fantasy–escaping the the natural world completely. 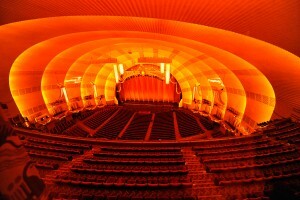 Radio city music hall is a self-contained and protected escape removed from space and time, protecting the visitor from everyday reality. It is an escape from the real. Placed within the neutral envelope of Rockefeller center, the physical location is negligible. With the development of Radio City Music Hall, buildings of the metropolis are not only a collection of new programs, they are the containers of metaphorical worlds. 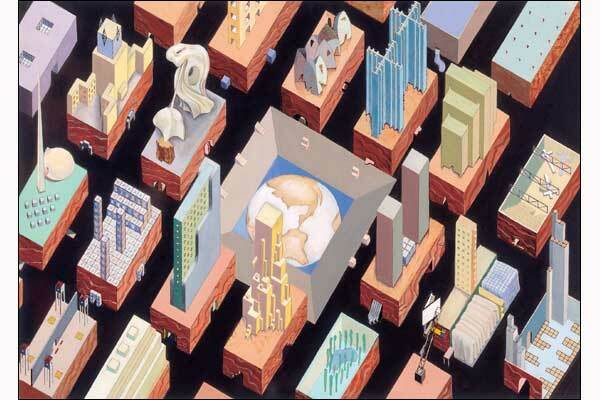 With the application of technology at the service of metaphor, the city expands without physically expanding. Like the skyscraper allows the infinite replication of physical space and programs, metaphorical constructs expand the immaterial space of the city. The metropolitan masses can occupy a hyper dense collection of metaphorical worlds disconnected and superior to the natural.